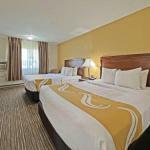 Boasting an indoor heated pool hot tub sauna and free Wi-Fi the budget-friendly non-smoking Quality Inn Mitchell is favorite among our guests. The two-story non-smoking Quality Inn hosts 59 comfortable rooms that feature free Wi-Fi premium cable TV hairdryers and coffeemakers. Some rooms have jetted tubs. Free coffee is available in the lobby all day and complimentary hot breakfast buffet is served each morning. As for relaxation you'll find an indoor heated pool hot tub and sauna on the premises. Meeting rooms and coin laundry facilities are available. There's ample parking on site complete with cold weather hook-ups for trucks and RVs. The Quality Inn is one mile from Cabela's a sporting goods store that caters to outdoor enthusiasts. The Corn Palace is less than two miles away and the Prehistoric Indian Grounds and Lake Mitchell are three miles. Sioux Falls Regional Airport is 65 miles from the hotel.